Our 4 Series augers are specially designed for mini loaders, skid steer loaders, tracked loaders and excavators up to 5 tonnes. For efficient drilling, the key is an effective auger cutting head. The heaviest augers in their class with 8mm thick flights. cutting. The RC4 now also features “gauge” teeth behind the lead outer tooth, to help maintain hole size. Need something longer? 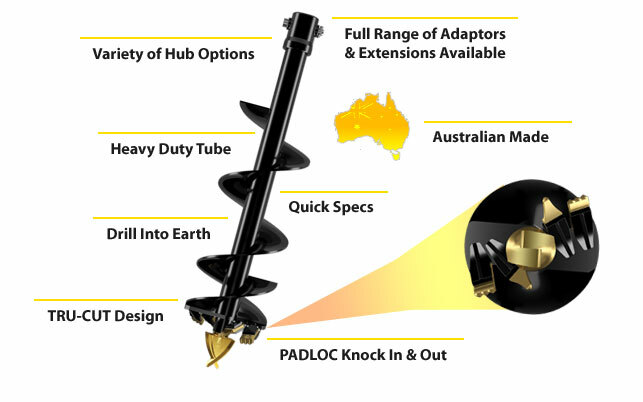 Digga West has a full range of auger extensions available to suit your specific requirements. Variety of hub options to cater for your specific needs. Heavy duty tube made from the highest grade steel. Dig holes in earth, hard soils, shale, dry clay and light to medium fracturable rock. Full range of adaptors and extensions available to maximise drilling depths. Proudly Australian manufactured. Providing customers with only the best quality for over 30 years. A 300mm auger cuts a 300mm hole. No more oversized holes. Easy knock in and out teeth require no special tools. For pricing or more information about the Rock Combination Auger: 750KG – 5T fill out the form and we&apos;ll be in touch soon. Alternatively call (08) 9457 1544.